Biliary cirrhosis is divided into primary biliary cirrhosis and secondary biliary cirrhosis. Primary Biliary cirrhosis pathologically is presented with formation of the granuloma in the periportal which lead to destruction of the bile ducts. There is also an infiltration of the lymphocyte in the portal tract which further cause destruction of the parenchymal of the hepatic which at the end results in hepatic cirrhosis. There will be a progressive green tint in the liver. There will an antimitochondrial antibodies detected in the primary biliary cirrhosis. Primary biliary cirrhosis mostly associate with autoimmune disorders such as rheumatoid arthritis, uclerative colitis, Crohn’s disease thyroiditis and Sjorgen syndrome. Secondary biliary cirrhosis commonly present with variation in the size of bile duct and development of the fibrous septa. There is a leakage of the bile and bile statis. There is an accumulation of bile in the hepatic parenchyma. These will finally lead to extrahepatic biliary obstruction which an the end cause an increase in the intrahepatic duct pressure. As a result hepatic duct will undergo fibrosis. The intrahepatic duct may predispose to bacterial infection which lead to ascending cholangitis. The common cause of secondary biliary cirrhosis is an obstruction of the extrahepatic biliary system. The liver may appear in a yellow green color. There will be increase in liver enzyme ( ALP) and hypercholesterolemia. 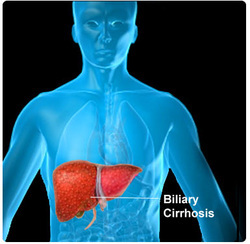 Women age 40 - 60 years may suffer from primary biliary cirrhosis. The common symptoms and signs of biliary cirrhosis are hepatosplenomegaly, xanthomas of the eyelids, tendons and skin, pruritus and obstructive jaundice. Finally patient may suffer from hepatic failure. The treatment for biliary cirrhosis are cholestyramine for itching ( symptomatic relief) and in severe cases of biliary cirrhosis patient may require liver transplant. 1.Scheuer, P. “Primary Biliary Cirrhosis.” Proceedings of the Royal Society of Medicine 60, no. 12 (December 1967): 1257–1260. 2.Adson MA, and Wychulis AR. “POrtal Hypertension in Secondary Biliary Cirrhosis.” Archives of Surgery 96, no. 4 (April 1, 1968): 604–612. doi:10.1001/archsurg.1968.01330220120020.